Cathedron is our award winning environment to design, develop, deploy and maintain data driven systems. 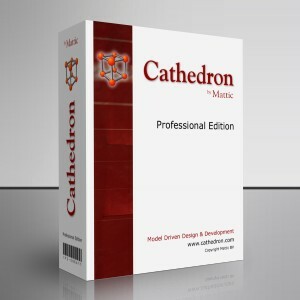 Cathedron combines the power of a model driven generator with a high order language and industry standard extendibility. This combination enables you to focus on the concepts (what should be made) instead of the technical details (how it should be made). Shifting your focus to the concepts radically enhances both the speed of development and the quality of the application. A typical Cathedron application requires only a fraction of the code you would have needed in a 3rd generation language. Your focus stays on the code that matters. Code that directly implements a restriction or a calculation. Code that is almost self describing and can be easily understood in the context of the accompanying model. A model that is always accurate since it is the heart of your application and intensely used by the generator. The combination of a generator and compact code also means there is little room for bugs. Finally due to the compact and self describing nature of the code, it is easier to share the development with others. Cathedron offers you a no-nonsense approach. The result is a powerful yet clean environment that is easy to understand and learn. It is this approach that sets us apart from other model driven tools. Click here for an overview of Cathedron. To build an entirely new system. To create a prototype for a new system. To continue building an existing system. Click here to continue to an overview (with screenshots) of Cathedron.